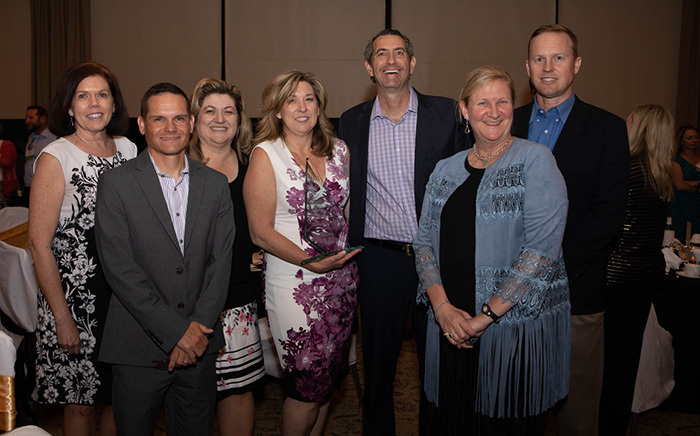 Lori Browning (holding her Controller of the Year Award) is joined at the dinner by GCU employees (from left) Kimberly Graf, Bill Brehm, Jamie Floyd, Dan Bachus, Lyn Bickle and Eric Engstrom. Lori Browning, Grand Canyon University’s Senior Vice President and Controller, was named Controller of the Year by the Arizona chapter of Finance Executives International (FEI) on Tuesday night. “Lori Browning believes that success isn’t the work of one person. Instead, it takes a village. It’s why upon joining GCU 10 years ago, Browning’s top priority was to recruit high-performing managers to oversee key functional areas of the department. She looked for leaders eager to expand their skills in much the same way that she has done during her 30-year accounting career. “During 25 years as a manager, she learned that creating a positive, fun work environment in which you acknowledge team members for a job well done reaps benefits for the entire department. So does creating a work environment that is flexible but fair to all employees, with or without families. Her motto is that if you want the best people to work hard for you, then you have to make the workplace work for them. The Arizona chapter of FEI has 220 members from a wide spectrum of companies. It was named “Most Outstanding Chapter” at the FEI Leadership Summit last year.